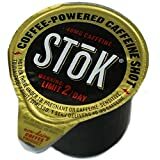 Stok Coffee Shots are a non-dairy creamer type shot come from Whitewave Foods under the Stok brand. There is a "sweet" version and a non-sweetened version. The cover of the tub reads "Black coffee shot. Equivalence: 1 shot espresso. 1 serving delivers 40mg caffeine. Limit 2/day. Warning: High Caffeine per ounce, so consume as directed. 100 SToK Caffeinated Unsweetened Black Coffee Shots. Sugar content: 1 grams (per 0.44 ounces). How Does Stok Black Coffee Shots Compare? 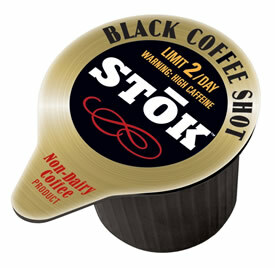 Stok Black Coffee Shots contains 90.91 mgs of caffeine per fluid ounce (307.40mg/100 ml). Caffeine information listed on label.